It would be easy to dismiss Divergent as a cash in on the popularity of young adult fiction adaptions right now, specifically the uberpopular Hunger Games franchise. And on the surface, it’s easy to see. Dystopian post-America future? Check. Strong-willed teenage girl as central character? Check. Family members in possible peril? Check. Fighting back against the system? Check. Pretty boy love interest? Check. But does that really matter? You can make a similar list for any subgenre, so it would be overly dismissive to discount Divergent for that alone. The film, based on the novel by Veronica Roth, has a somewhat silly premise: set in the future ruins of Chicago, the people have been divided into five factions based on a Myers-Briggs-esque personality system, with each faction performing a role in society. Candor, the honest, are lawyers and judges, Amity, the hippie farmers, Erudite, the intelligent, are scientists and teachers, Dauntless, the brave warriors, and the Abnegation, the selfless government workers. There are also the factionless, who are basically homeless people that rely on the other factions for food. Teens take a test to help determine which faction they should belong to for the rest of their lives, potentially leaving their families behind (“faction before blood” is a recurring quote). Beatrice (Shailene Woodley), born into Abnegation, has never felt like she fit in, her feelings are reconfirmed when her test results are inconclusive. She is Divergent, meaning that she could be successful in more than one faction. 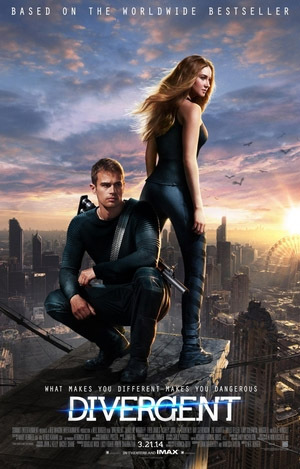 She chooses to join Dauntless, and the film follows her initiation into the faction, her training by Four (Theo James), and uncovering a plot by those in charge that will have disastrous results. While the production design never does anything special beyond ruined urbanscape, and explaining the rules of the film’s society doesn’t do it any favors, the filmmakers behind Divergent get one crucial piece right: casting. Shailene Woodley has no problem carrying the film on her shoulders, exuding the right mix of unsure and confident that a teen protagonist should. While many will compare her performance to Jennifer Lawrence, Beatrice is actually a much different character than Katniss, and faces largely different challenges. But the plum casting choices don’t stop at the lead role. Divergent has a stacked supporting cast, starting with Kate Winslet taking a villainous turn as Jeanine Matthews, the head of Erudite, and rounded out with Ray Stevenson, Ashley Judd, Tony Goldwyn, and Miles Teller. I was also impressed by Theo James. The male lead in a young adult adaptation is normally a thankless role, but he gives his all playing Four, making him ever slightly more interesting than anyone from the Hunger Games or Twilight love triangle. 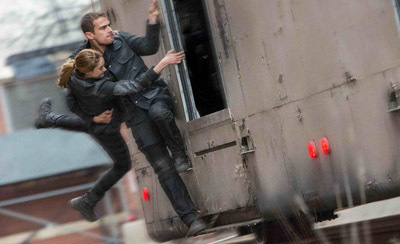 The other key factor to making Divergent a satisfying film is its structure. While the third act feels rushed and slightly overcomplicated, the script is right to spend the bulk of its two and a half hours laying the groundwork for the entire series. While the relationships between minor characters are likely not as clearly defined as they may be on the page, the major relationships feel earned rather than explained. And while current pop songs are often jarring in a dystopian science fiction film, Ellie Goulding is an inspired choice, and using her throughout the film in conjunction with Junkie XL’s distinct score give Divergent a unique aural identity. Divergent is a pleasant surprise, and a classic case of the whole being better than the sum of its parts. The already familiar teen love story wrapped in Brave New World trappings means it won’t blow any minds, but it’s an engaging, even scrappy piece of entertainment that stands on its own as a trip worth taking. Divergent opens today in Philly area theaters.